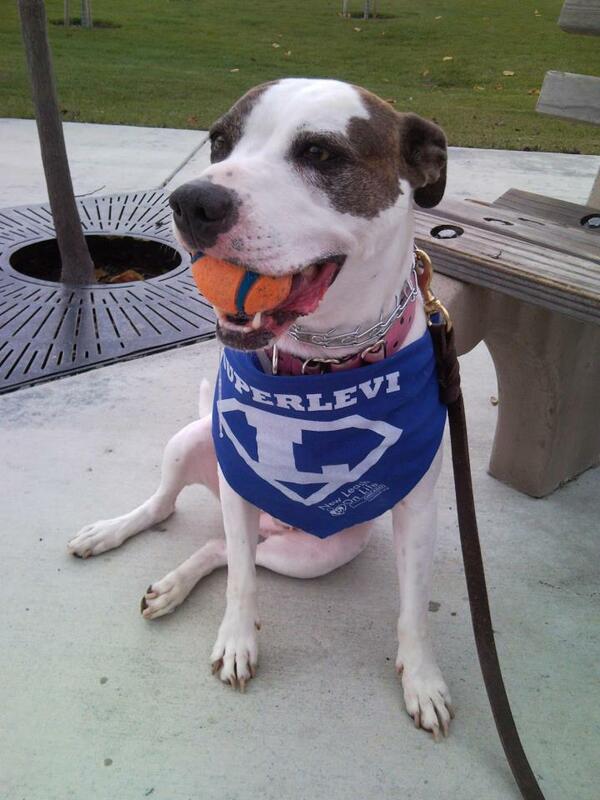 For the longest time we couldn't figure out why it was taking so long for SuperLevi to be adopted. 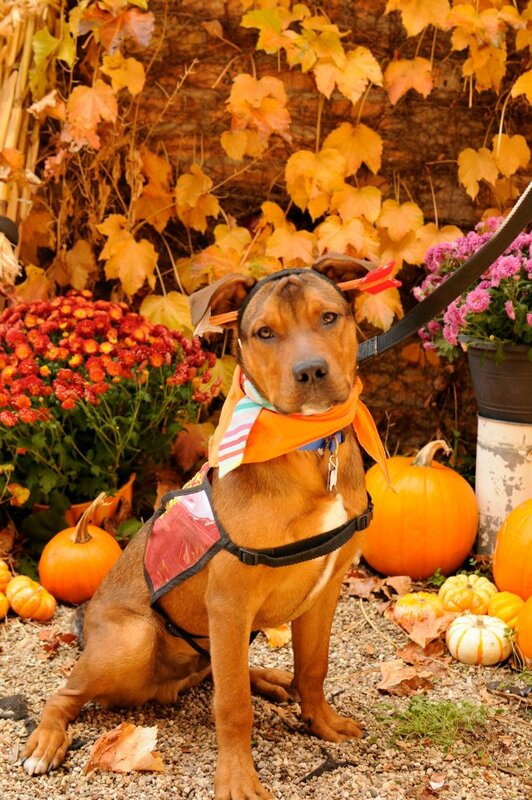 Besides being a fantastically easy city dog, hanging out at outdoor cafes and neighborhood festivals with ease, he is incredibly handsome, goofy, and comes with his own superhero roll. 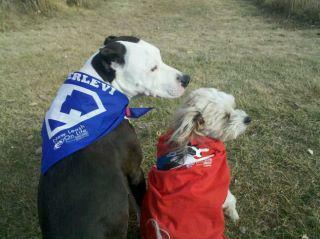 But when we met his new family, we realized why it had taken so long: he needed to be reunited with a fellow superdog. See, this is Greta. And she comes with her own superhero story. When Greta was rescued as a pup, she was severely malnourished with festering open wounds. 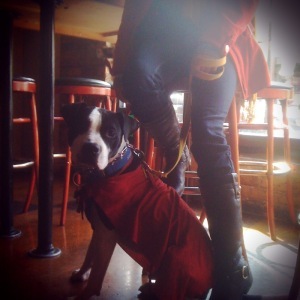 But, this courageous pooch used her superdog powers to overcome it. Though at a mere 2 1/2 years old, it seems those evil villains had come back to rumble with Greta again, this time in the form of blood cancer. And in this tougher battle, Greta sacrificed a limb, but came out with her dignity and spirit. And while the oncologist estimated it was only a matter a months, Greta has used her superdog strength to go beyond this estimate, full of energy and sass and able to outrun all her 4-legged friends. 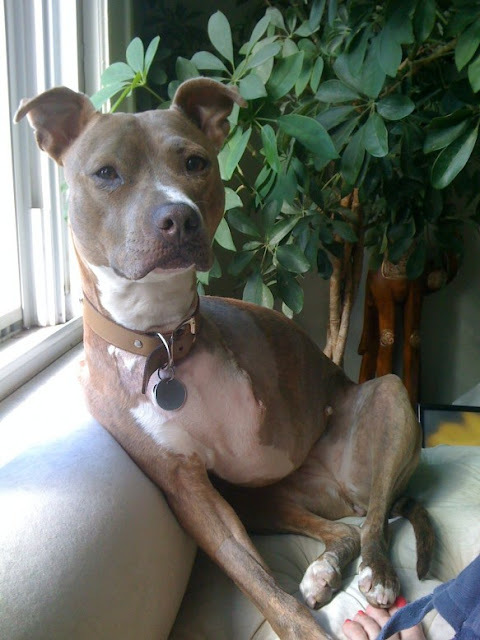 As Greta's Mom says: When Greta, my 3 year old rescue pittie, was first diagnosed with blood cancer, it hit me like a ton of bricks. For the first couple weeks, I walked around in a daze and it constantly felt like an elephant was sitting on my chest. Her oncologist told me it could be a matter of a few months, and this was something I just couldn’t wrap my head around. She has become such a huge and positive part of my life, and after having her for less than two years, I just wasn’t ready to let her go. After she had the amputation surgery to get rid of her tumor and she began to heal, it became apparent that she isn’t ready to go anywhere either. Her energy is still up, she is getting around great and she still has a lot of life left in her. She is one tough cookie, and I am continuously inspired by her resilience. 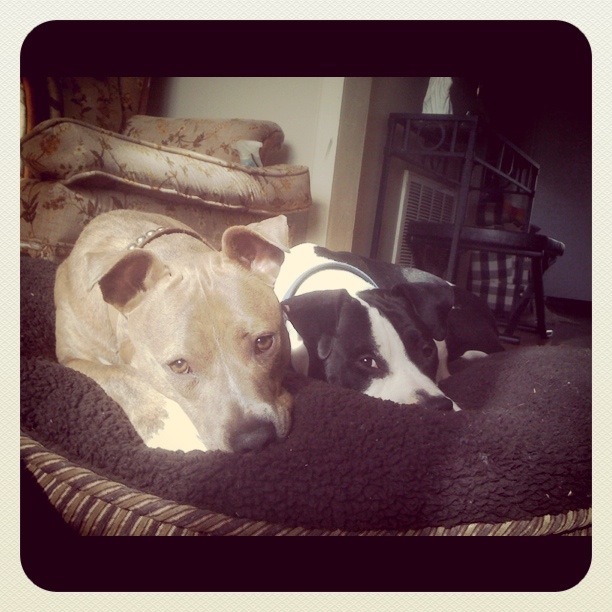 Before she was diagnosed, I started thinking about fostering a second dog. I have a very flexible work schedule and was finally feeling financially stable enough to help out another furry friend. This idea was put on the back burner while figuring things out with Greta, but soon after she healed from her surgery, I was more interested than ever in a second dog. But, given the circumstances, I decided to adopt instead of just foster. 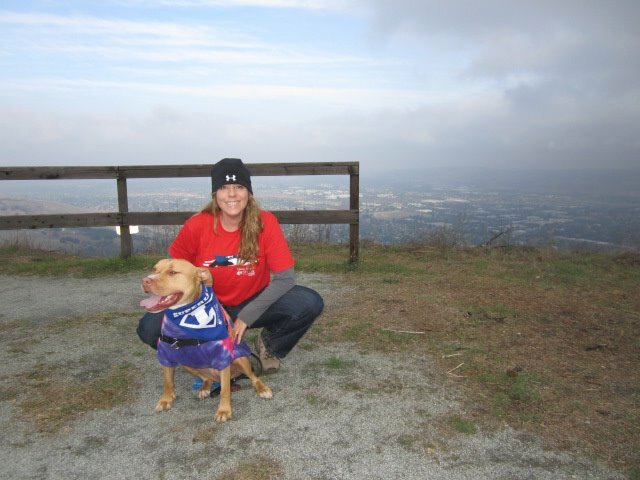 I felt like it would really help Greta enjoy her time left, give me some comfort for the future, and then there was the added bonus of providing another dog with a very loving home. Now the big question: How do I find the right dog to bring into our family? I’ve been a fan of the blog Two Pitties in the City for a while now, and when I saw Levi, their fun-loving foster dog, I fell in love. Greta can be a little picky when it comes to her companions, but she has a big soft spot for male pit bulls with lots of energy. Plus, his alter-ego is Super Levi, so maybe he would be able to tap into his super healing powers to help Greta? It sounded like a match made in Heaven. When we first decided to bring Levi into the household, I remember saying to my boyfriend “I wonder if he will have as many strange quirks as Greta?” I should have known better after reading the Two Pitties blog…what a goofball! So far he has kept things so light and fun around the house, we’ve barely even thought of Greta’s cancer at all. 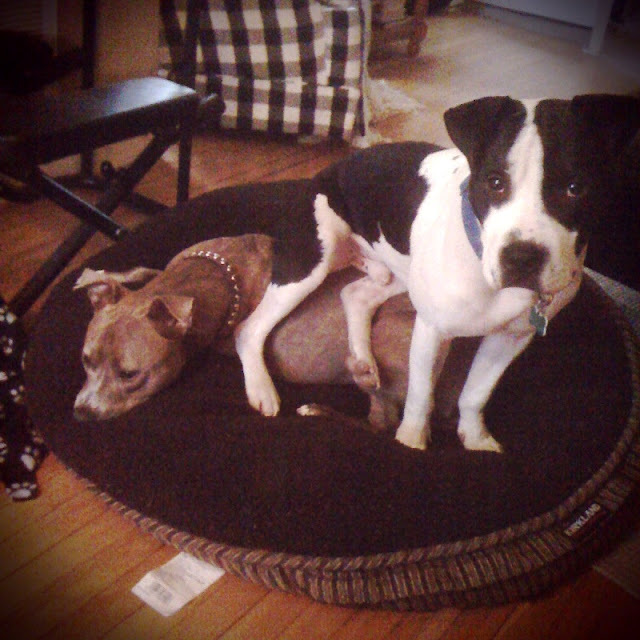 Although it took her a couple days to warm up to his overzealous nature and inherent lack of boundaries (check out the pic below of him sitting on her), he has grown on her significantly. They are best buds now, and I have never seen her so happy and at ease. She grows to love him more and more each day, and it’s actually quite amazing to watch. The best part, we will still be able to see plenty of SuperLevi. Not only did we get the luck that from the entire Chicagoland area he lives mere blocks from us, but just like any great superhero, he has his own 'spinoff' blog. You can see his handsome face and read about his crazy adventures on Greta's blog here. We had so many people supporting us in finding Levi's (super) x-ray vision that we were all able to save SuperLevi's x-ray vision AND have enough money left over to rescue another dog in need of medical care. Please read this incredible thank you note from his rescue, New Leash on Life, because now "one sick pup in Chicago's pound who has been dreaming of rescue will have its wish granted-all because of you and Super Levi. 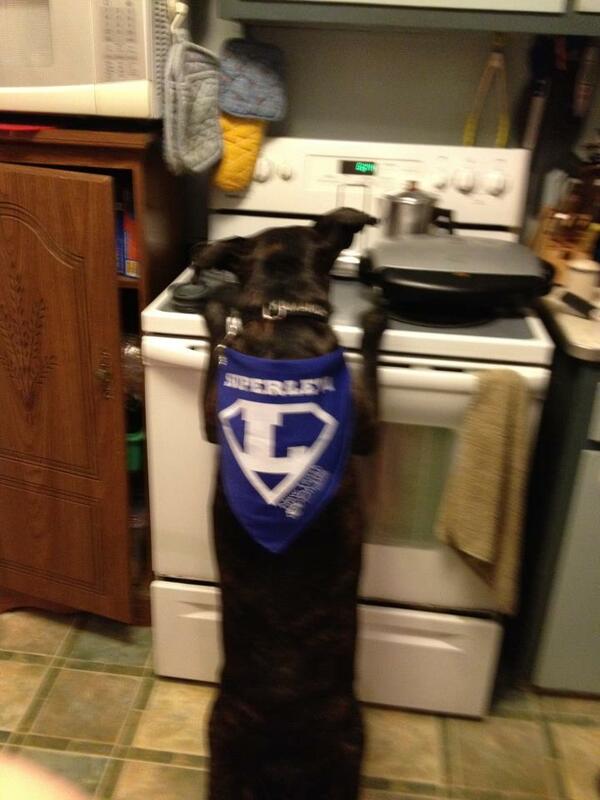 So we'd like to say one last SUPERSIZE THANK-YOU FOR HELPING SUPER LEVI." We really wish we were like Oprah where we could give prizes to everyone, but since we're just us...our friends at New Leash drew the raffle results using a random number generator. Winners: Watch for an email letting you know how you will receive your prizes. We can't thank you all enough for helping SuperLevi save his x-ray vision. 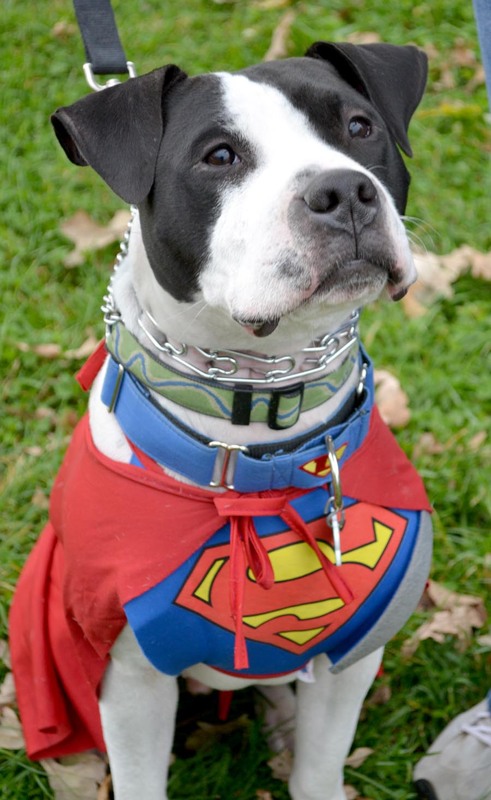 Check SuperLevi's blog for updates on his new life and upcoming surgery, and stay tuned to meet that special pooch who has been dreaming of rescue, and will now have his wish granted. 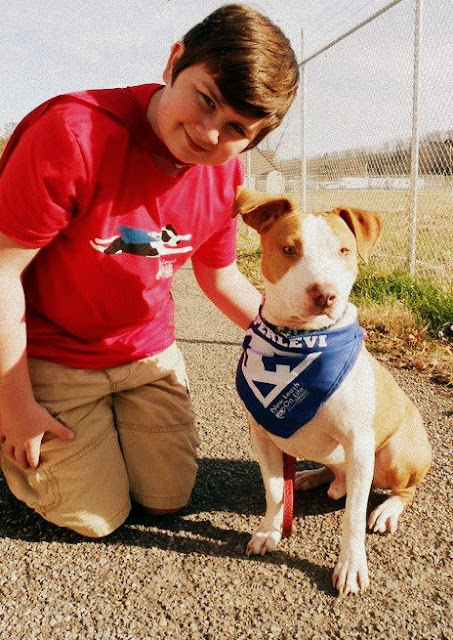 Thank You, Thank You, For Saving SuperLevi's Eyesight! to raise a total of $4,600 in a few short weeks! Super Levi's vision is safe! what kinds of "medical cases" they have and which ones might be a good fit for the NLOL family. been dreaming of rescue will have its wish granted - all because of you and Super Levi. So we'd like to say one last SUPERSIZE THANK-YOU FOR HELPING SUPER LEVI. And last but not least, all the fantastic NLOL volunteers and supporters who got the word out, shared Levi’s story, and walked in his honor! Super Levi just can't contain his excitement! 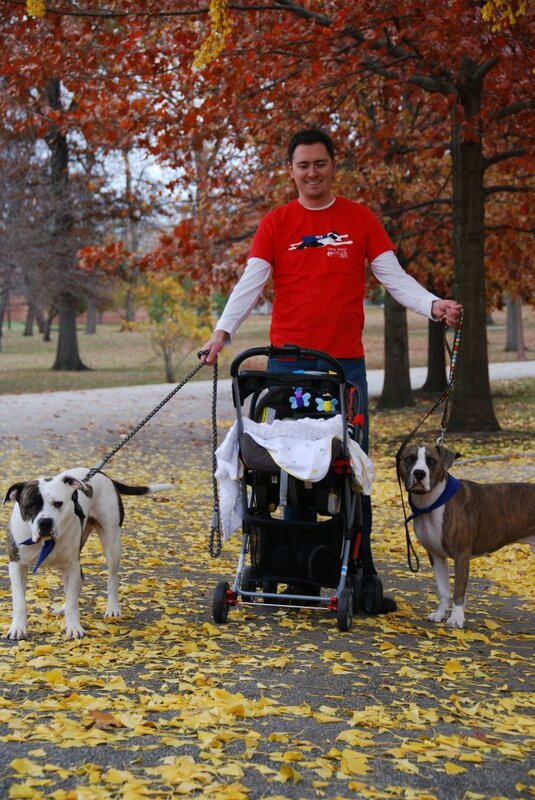 His vision is safe, he's made a million new friends, and he helped rescue another sick pup from Chicago's pound! He's a superhero, indeed! Levi is flying off to his next big adventure, with his vision safe from those evil villains! Stay tuned for more details! We have been beyond astonished by the amount of support flooding in for our little SuperLevi, and seeing how far his story reached has been truly humbling. We have received support from 36 states, plus Canada! 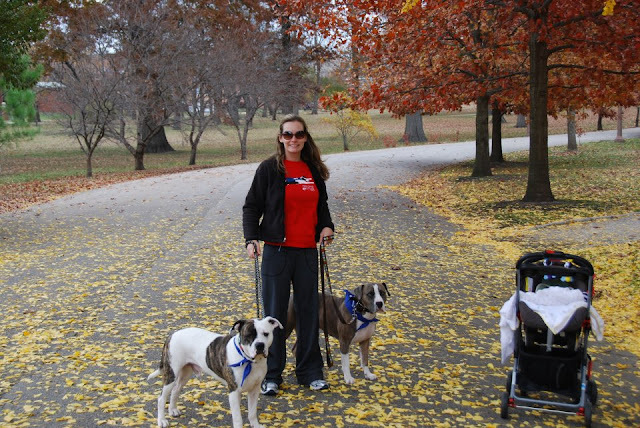 While we know some people are even vacationing and will have photos coming soon, we were beyond overwhelmed to see so many proud pooches across the nation walking in honor of SuperLevi and wishing him well. 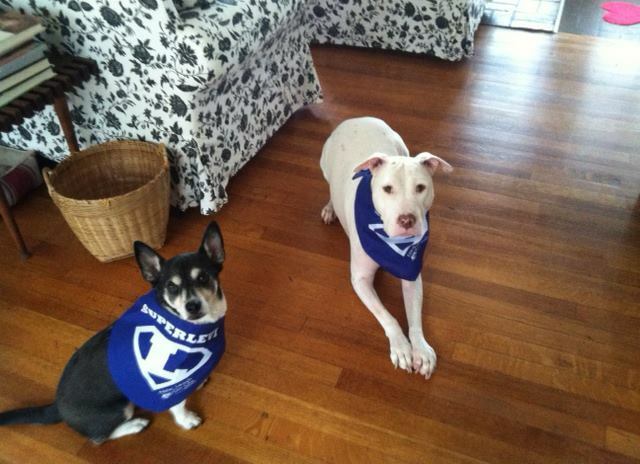 From former foster dog Pauley James and his boy, all the way in Kentucky sitting proudly. Rachel, Joe, Luke (the black lab mix) and Amy (tiny foster fail pitbull!) out in Cream Ridge, New Jersey. 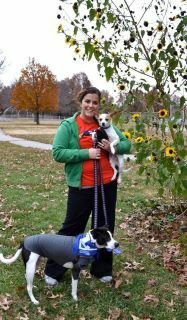 Turk and Rufus out in Kansas City. Lark and Lola hiking out in California. 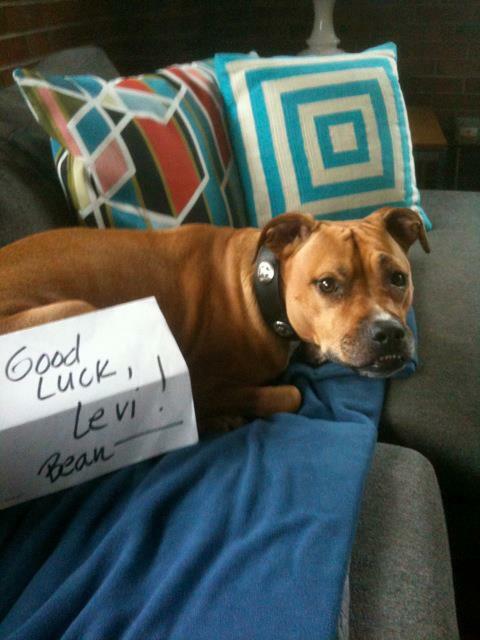 Another Levi in West Virginia sending support. 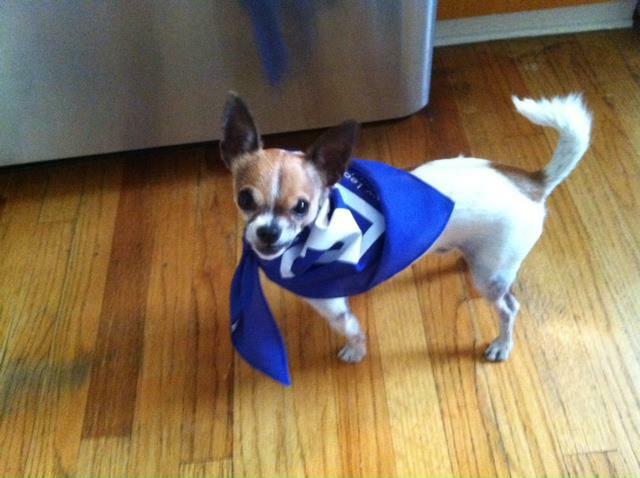 And even little Mouse who is so small his bandana is more like a cape. But he wore it with attitude. Jazmin and Maggie with the wind blowing through their ears all the way in Minnesota. Fellow New Leash on Life Alumni Kameko and Jude. Jude is even showing how excited he is to walk! 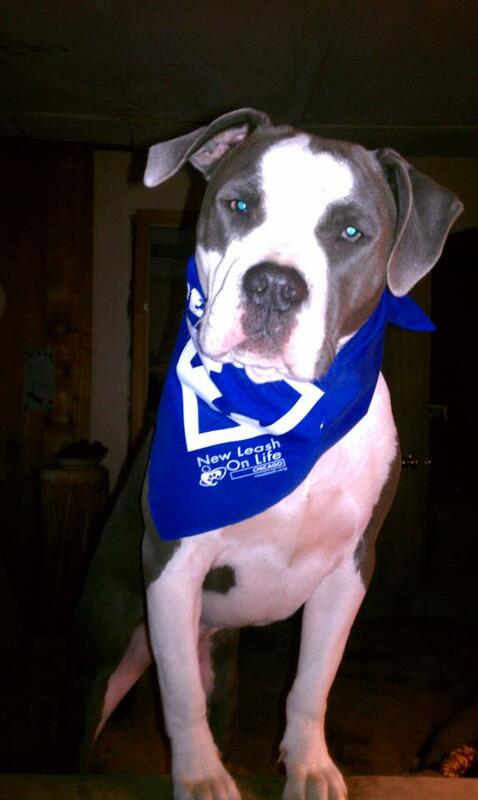 Kind words from New Leash on Life alumni Bean. 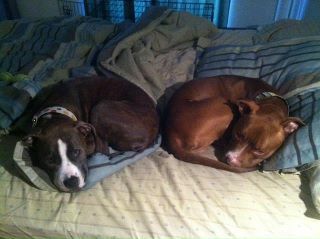 Bean and Miss M were in the same 'pledge class' as they were pulled from ACC at the same time. It has been so amazing to have all this support and see how everyone has really helped out so much. 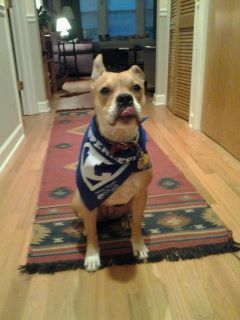 We are still excited to see photos from those walkers who had to be out of town for the weekend. Here is a sneak peek of our local Chicago walk where 20+ dogs, dressed in Superhero gear, descended upon the Wrigleyville neighborhood. 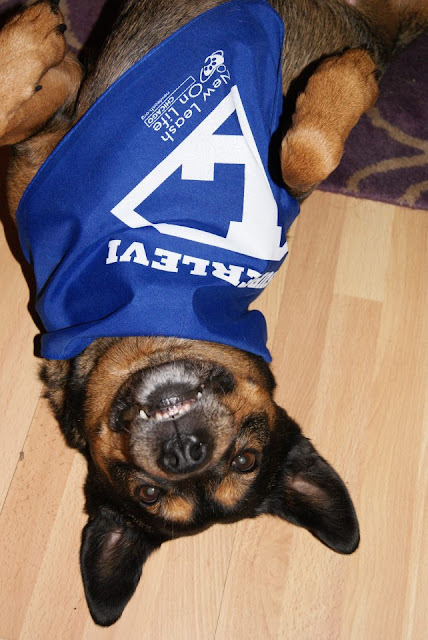 Some of the pooches even do superhero tricks! 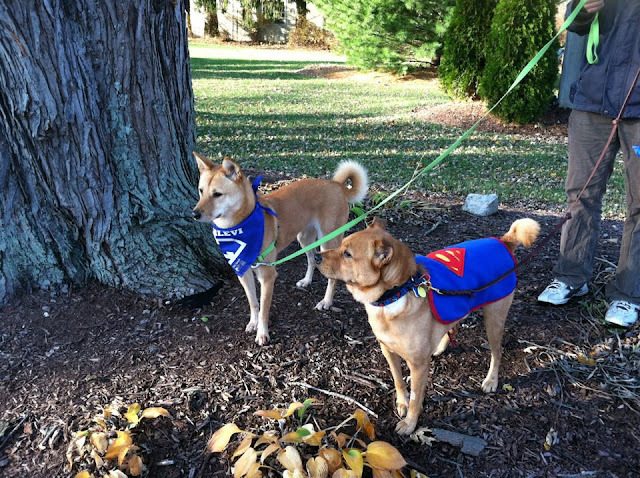 We have been very excited about the response to SuperLevi's Superhero walk to save his (super)vision, and here are the long-awaited details about the walk occurring next weekend. We will be returning to one of Levi's favorite places and our walk will be beginning and ending at Chicago's iconic Wrigley Field. Place: Wrigley Field (starting and ending) We will have a fun 2 mile walk winding through the streets of Wrigleyville. Time: "Registration" and T-shirt distribution begins at 9:30. The walk begins promptly at 10:00. Events: Feel free to dress for our Superhero theme (Spoiler Alert: Miss M is coming as the 'Kissing Bandit'!). We will have photo opportunities with your pooches and photos with SuperLevi, Miss M, and Mr. B, and a couple other fun surprises. Other: Because we are expecting a high volume of dogs in one place, no retractable leashes please. 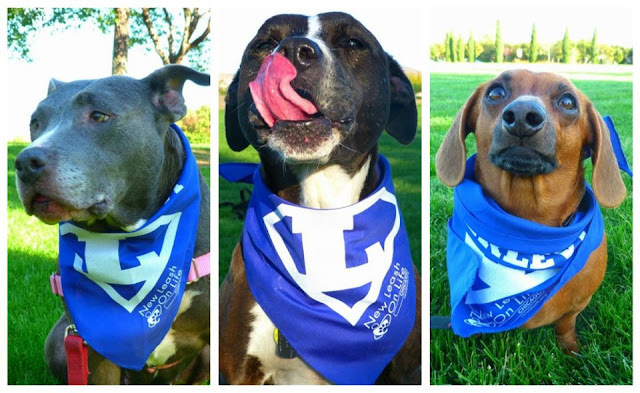 We were very excited to receive so many T-shirt and bandana orders from far away, and we would love to see your photos of you and your pooches walking in SuperLevi gear. Just like on New Years Eve where there are constant reports coming in, please post your photos onto Facebook throughout the day so we can see who is walking and where you're from. -On Two Pitties in the City Facebook page here. 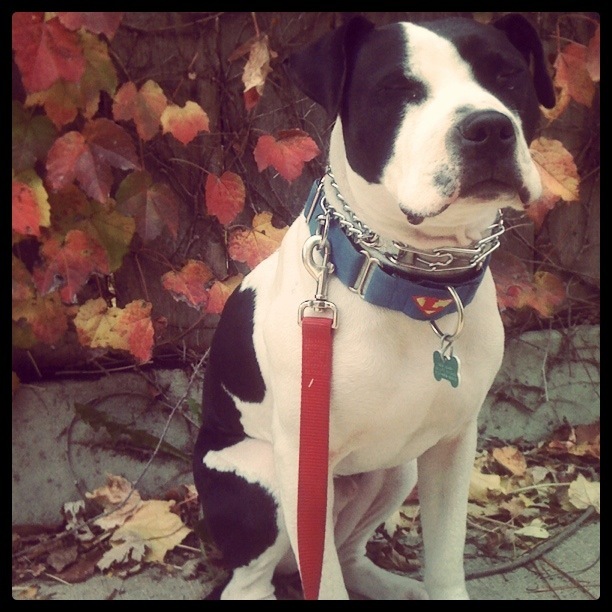 -And New Leash on Life Chicago Facebook page here. -Please also email us your photos, using the envelope icon on the side of our blog, with the photos of your walk and heading 'SuperLevi Walk' so we can use them in an upcoming post. 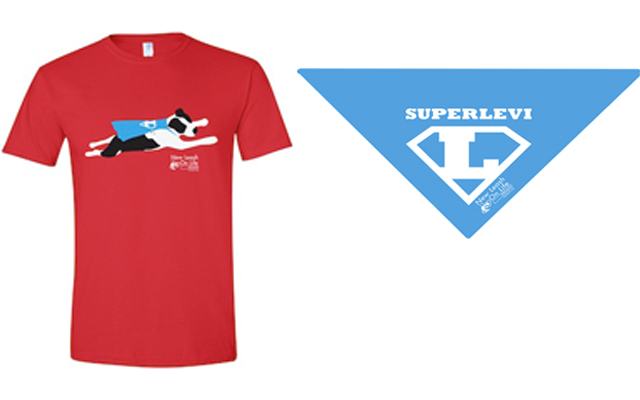 There is still time to order your flying SuperLevi T-shirt and dog bandana. 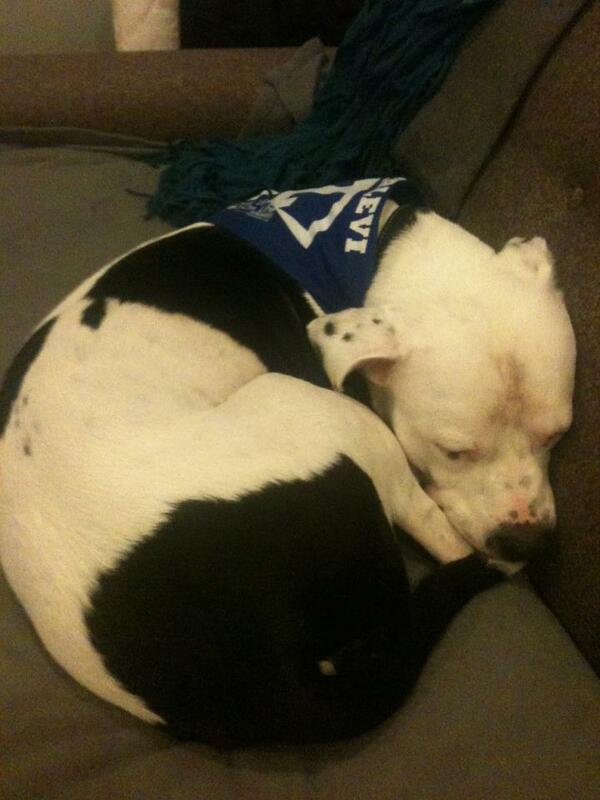 T-shirts are $30 (+$3 shipping) and include a bandana. 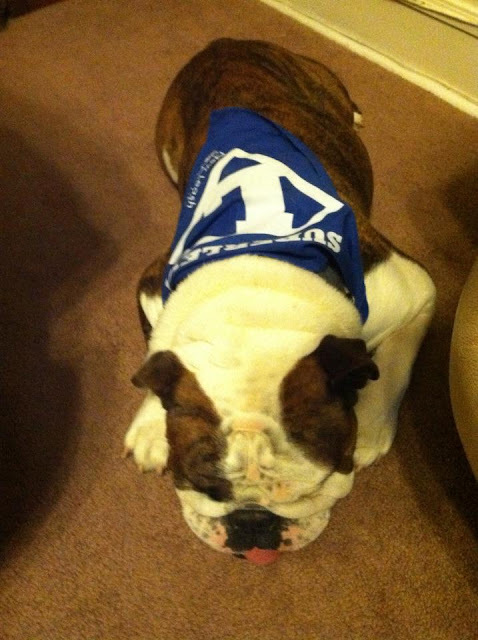 Extra bandanas are $15.Buying 2 shirts gives you 1 raffle ticket. We are also having an AMAZING raffle where the odds of winning are really, really good. We are raffling off a Ruffwear Jacket, (2) Custom Knit Dog Sweaters, GoPro Camera, Ruffwear Backpack, Sirius Republic Collar, Silly Buddy Collar, and doggy care package. Read more about our raffle here. Donations can be made securely at Levi's Rescue group, New Leash on Life, here. Note "For Levi" and indicate the size shirt or raffle prize you would like to win. Thanks again to everyone for your support; the response has been so overwhelming! PS. 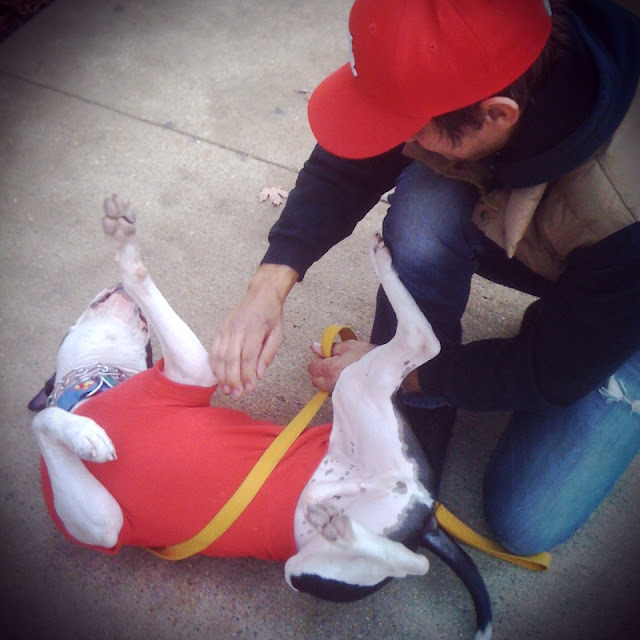 Photos taken by Emily of Our Waldo Bungie while she was visiting our SociaBulls walk. Aren't this photos so great? Where do city dog go to relax? 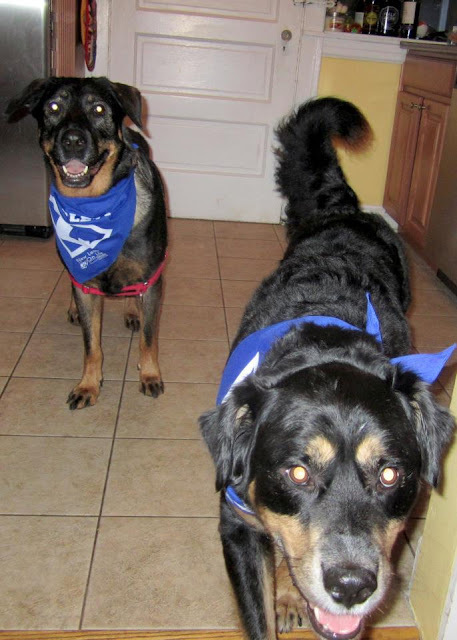 Check out NLOL alum Lola (formerly Miss Flo) as she vacations with her brother Franklin in dog-friendly Harbor County, Michigan. We just returned from a week in Harbor Country, Michigan with our two dogs, Lola (big pitty girl) and Franklin (little shaggy guy). Lola and Franklin Chicago city dogs and don't often get to run in wide open spaces or go swimming, so we decided to find a not-to-far away retreat for our summer vacation this year and take them with us. We found the perfect rental house on homeaway.com, called "It's A Dog's Life" boasting a large fenced in yard with doggy door and lots to do with the pups. Worried that it might not be as great in reality as it looked online, we loaded up the car, and drove the 80 miles to our temporary home. Not only was the house dog-friendly, but the owner provided a list of places to go with your dog. We took them to Weko Beach where they cooled off in Lake Michigan and hung out on the beach. We did the tourist thing in New Buffalo. We tried going for a hike but the bugs were too bad to even stop to take a picture. There was even CDs of pet spa music to soothe the dogs in an unfamiliar environment when the humans went to the nearby brewpub. (sorry mom! I don't always make the bed on vacation). We're planning a return visit with the pups in the fall, when we can get that hike in and see the fall color. 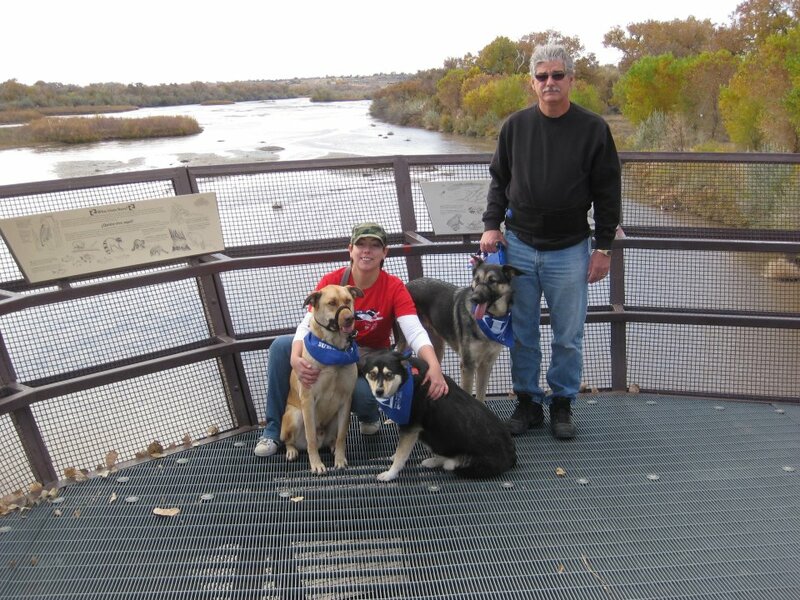 From the moment we rescue our dogs from the shelter, we consider them family.